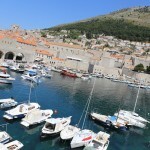 A walled, sea-battered city lying at the foot of a grizzled mountain, Dubrovnik is without a doubt Croatia’s most popular tourist haunt. 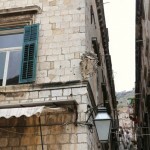 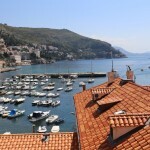 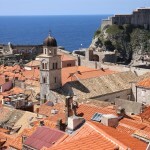 An essentially medieval town reshaped by Baroque planners after a disastrous earthquake in 1667, Dubrovnik’s historic core seems to have been suspended in time ever since. 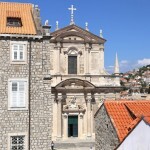 Set-piece churches and public buildings blend seamlessly with the green-shuttered stone houses, forming a perfect ensemble relatively untouched by the twenty-first century. 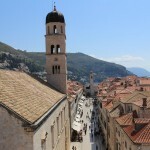 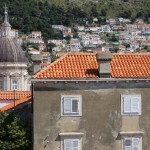 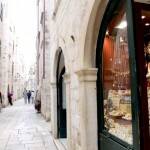 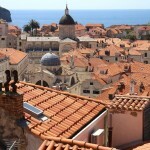 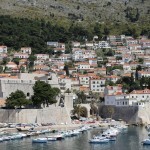 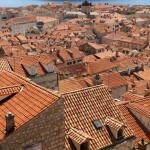 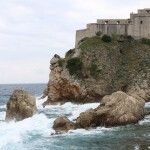 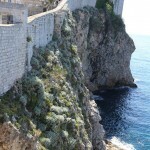 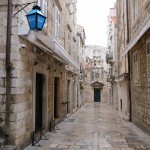 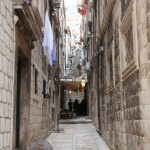 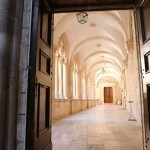 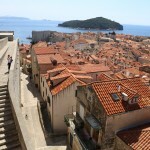 I spent 48 blissful hours adventuring through Dubrovnik’s ancient alleyways, a fantastic finale to my Insight Vacations whistle-stop tour of the Dalmatian Coast. 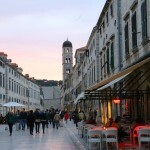 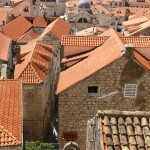 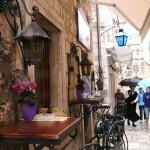 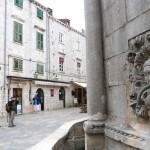 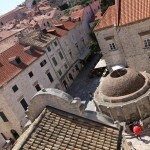 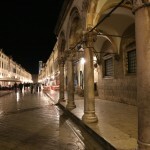 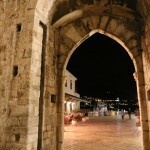 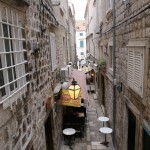 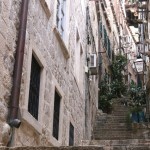 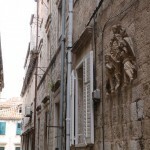 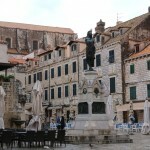 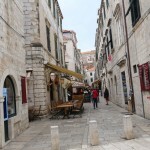 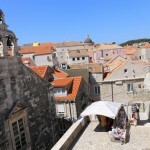 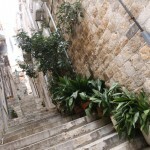 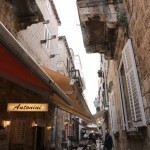 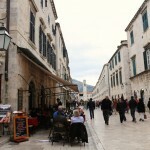 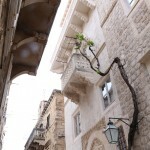 During the spring and summer the city’s historic walled medieval quarter fills to the brim with eager tourists. 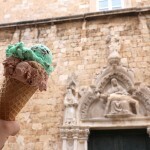 After spending two days sussing out the city on the solo I must say the best way to spend an afternoon here is by lounging on a pretty sun-drenched patio while sipping espresso or devouring a creamy gelato topped cone. 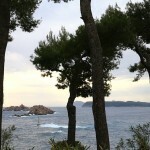 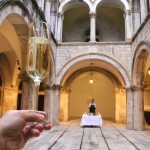 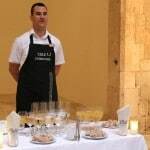 On our first evening we enjoyed a delightful champagne splashed welcome as guests of the Dubrovnik Tourist Board. 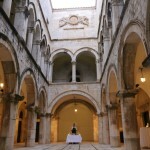 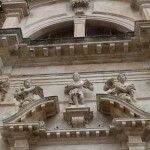 The magical reception was hosted at Sponza Palace, once the city’s custom house and mint, which features broad Renaissance arches on the ground floor and florid Venetian Gothic windows on the first floor. 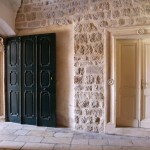 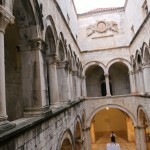 Inside, the majestic courtyard is given over to art exhibitions and occasional concerts in summer. 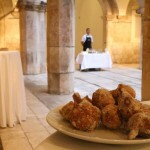 After skipping through the front door a choir of servers offered flutes of sparkling while white linen draped tables featured silver platters teaming with addictive local donuts flecked with sweet raisons and tossed in icing sugar. 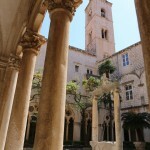 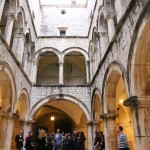 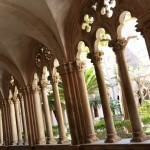 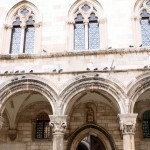 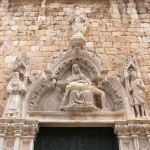 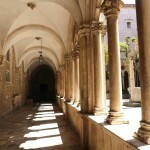 Entered via a narrow passageway from the Stradun’s northern side is the fourteenth-century Franciscan monastery, whose late Romanesque cloister is decorated with rows of double arches topped by a confusion of heads and fantastic animals. 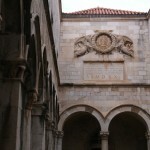 The attached museum is also worth a look, with manuscripts tracing the development of musical notation, together with relics from the apothecary’s shop at the entrance to the cloister. 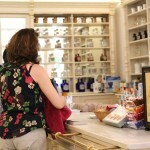 Established in 1317, and still in business, it calls itself the oldest pharmacy in Europe. 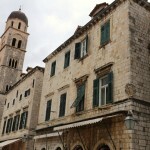 Recipes used to prepare some of the balms and ointments you can buy here are more than two hundred years old! 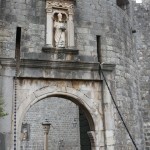 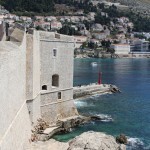 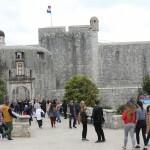 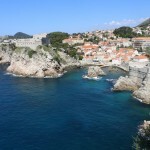 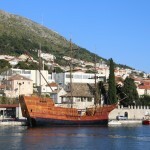 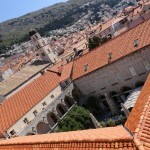 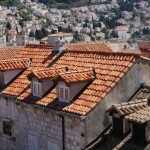 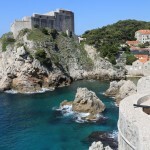 Dubrovnik is surrounded by unique medieval ramparts preserved in their original form and open to visitors as the city’s flagship attraction. 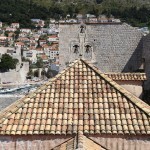 At 25 metres high and stretching for some 2 kilometres, the walls completely surround Dubrovnik’s historic heart, taking just over an hour to walk the full circuit. 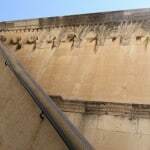 The walls are encrusted with towers and bastions, and it’s impossible not to be struck by their remarkable size and state of preservation. 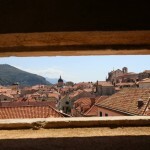 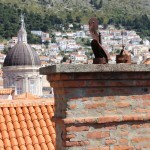 Once you’re on top, the views over the town are a patchwork sea of terracotta tiles, punctuated by sculpted domes and towers and laid out in an almost uniform grid plan. 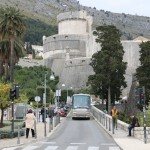 Clockwise around the walls from the Pile Gate, it’s a gentle two-hundred metre climb towards the fat, concentric turrets of the Minceta Fortress, which guards the Old Town’s northern corner. 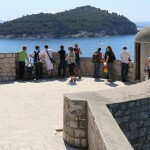 From Minceta it’s a farther 500m around the walls to St Luke’s bastion, where you have an excellent view of the Revelin Fortress and the Old Port area; and another 200 metres to St John’s Fortress, a W-shaped curve of thick stone facing out sea. 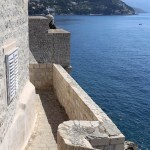 The views along the wall are absolutely breathtaking and while I’m strolling on the solo plugged in to Robyn’s Dancing On My Own I can’t help but feel like my breath has been taken away. 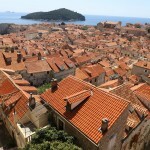 One’s first impressions of the city quickly change after scaling its walls, the benefit of a birds eye view. 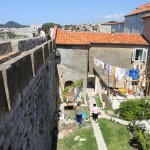 It’s also a reminder that 1300 inhabitants call life inside these ancient walls home, even though it can often feel as though you are walking through an open air museum. 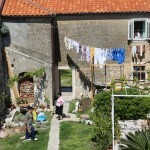 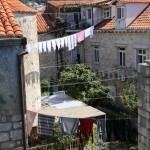 Laundry sways on the line in the wind, little Croatian granny’s tend their petite gardens while their husbands sip espresso on sun-soaked balcony. 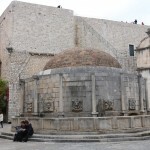 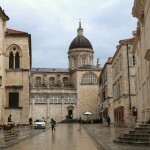 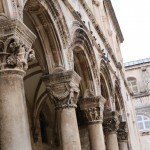 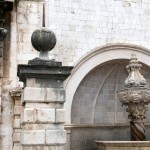 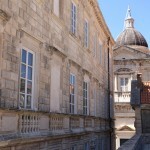 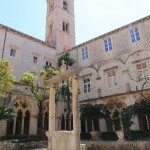 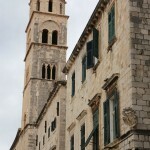 The bulky grey building rising south of the Rector’s Palace is Dubrovnik’s cathedral, a plain but stately Baroque structure began by Andrea Bufalini of Urbino in 1672. 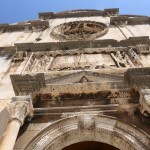 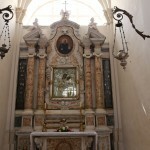 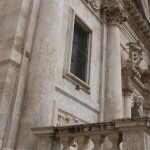 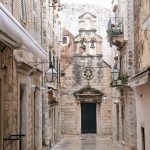 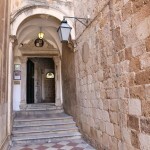 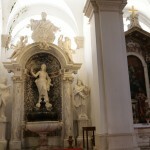 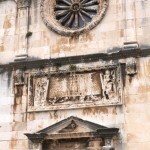 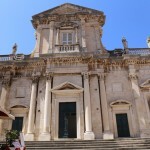 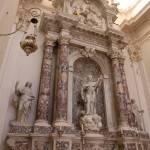 According to legend, the original church – destroyed in the 1667 earthquake – was funded by a votive gift from Richard the Lionheart, who may well have been shipwrecked (and saved) off Ragusa on his way back from the Third Crusade, though traces of the original church’s foundations have revealed that it actually predated Richard’s visit by a couple of decades. 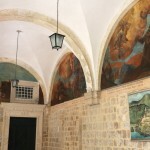 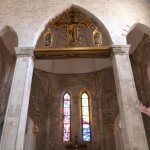 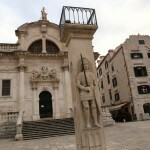 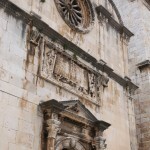 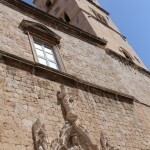 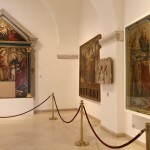 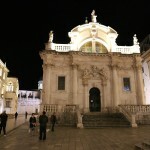 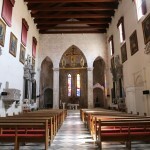 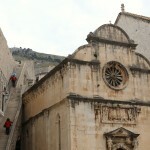 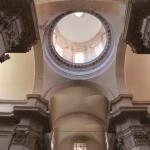 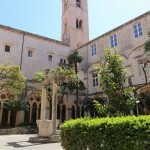 Inside the cathedral are a couple of Italian paintings, including Titian’s polyptych The Assumption behind the main altar, a work originally purchased by the Brotherhood of the Lazarini – sign of how rich some of Dubrovnik’s commoners’ associations really were. 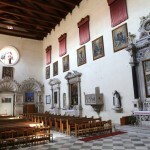 The west side of the nave holds the icon of Our Lady of the Port, a Veneto-Byzantine Maddona once carried through the streets in time of drought on account of its rain-making powers. 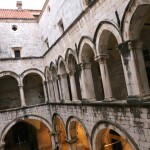 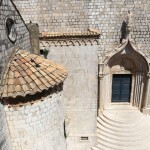 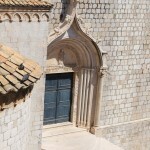 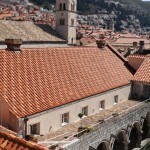 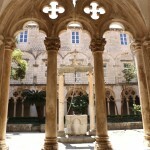 Begun in 1301, the construction of Dubrovnik’s Dominican monastery was very much a communal endeavour: owing to its position hard up against the fortifications, the city authorities provided the Dominicans with extra funds, and ordered the citizenry to contribute labour. 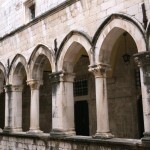 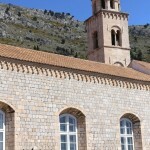 The monastery is approached by a grand stairway with a stone balustrade whose columns have been partly mortared in, an ugly modification carried out by the monks themselves in response to the loafers who stood at the bottom of the staircase in order to ogle the bare ankles of women on their way to church. 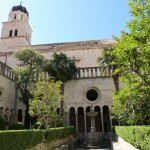 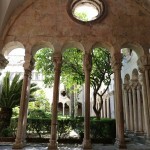 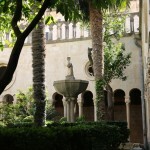 At the top of the steps a doorway leads through to a fifteenth-century Gothic Renaissance cloister, filled with palms and orange trees. 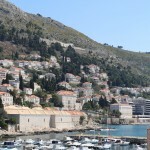 On the final evening of our trip we bid the Adriatic farewell via quaint cruise at sunset which set sail at Dubrovnik’s New Port. 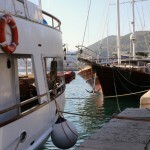 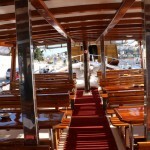 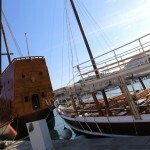 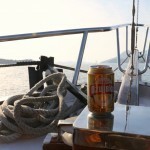 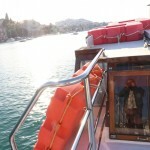 We were greeted by an affable captain who offered up celebratory shots of spiced grappa and cold cans of local lager. 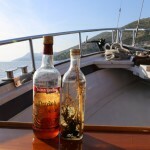 I unwound my hair, letting my mane whistle in the wind as we cruised past posh yachts and stately seaside mansions. 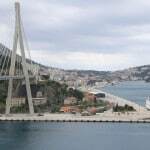 We passed by the city’s iconic modernist Franjo Tudman Bridge, a cable-stayed bridge which appears like a harp resting on its side just as crimson sun splashed across horizon.